If Friday’s sold out Festin Acadien Avec Homard in Abram-Village is any indication, the 2017 Fall Flavours Festival will enjoy a very busy month in September. 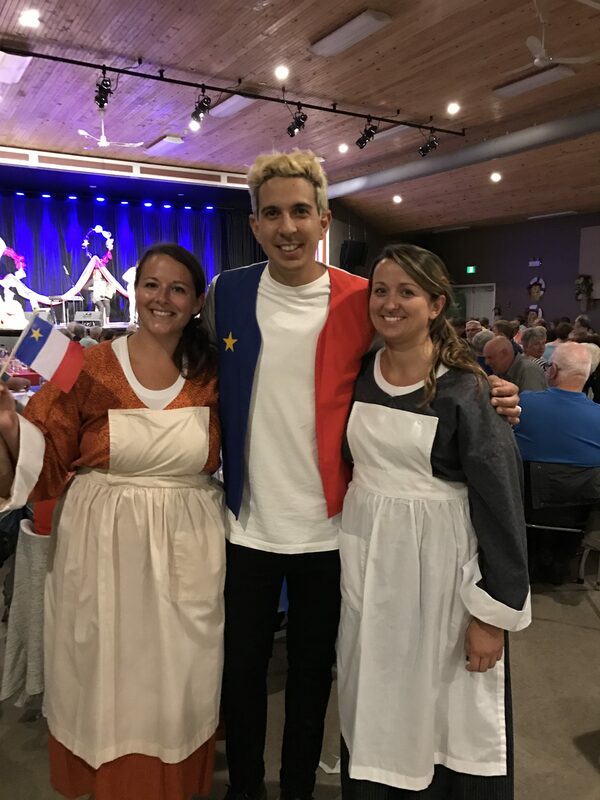 Celebrating its 10th Anniversary this year, Fall Flavours officially kicked off Friday with Festin Acadien as the first of its twelve Signature Events. Each Signature event is hosted by a celebrity chef, this year including chefs Michael Smith, David Rocco, Danny Smiles, Chuck Hughes, Lynn Crawford, Mark McEwan, Vikram Vij and Corbin Tomaszeski. Other Signature Events this year are Toe Taps & Taters (Sept. 8, Chef Chuck Hughes), Oysters on the Pier (Sept. 9, Chef Michael Smith), Lobster Party on the Beach (Sept. 10, Chef Mark McEwan), PEI International Shellfish Festival and Feast & Frolic (Sept. 14 – 17, Chef Lynn Crawford and Chef Chuck Hughes), Beef N’ Blues (Sept. 15, Chef Michael Smith), Savour Victoria (Sept. 22, Chef David Rocco), Namaste Lamb (Sept. 23, Chef Vikram Vij), Great Big BBQ (Sept. 28, Chef Corbin), Chef’s Island (Sept. 30, Chef Michael Smith), and Grilling and Chilling (October 1, Chef Michael Smith). “This year we are especially excited to introduce our newest events, Taste of Coastal Communities,” says Rowe, “Three different events, offering one-of-a-kind experiences in the most scenic corners of the Island, hosted by Canada’s top working chefs.” Events include Taste of Historic Georgetown (Sept. 7), Taste of Tyne Valley (Sept. 21) and Taste of North Rustico (Sept. 29). Each event will also boast local and seasonal ingredients and culinary creations by talented local chefs. Other events include a new VIP event, Ultimate Chef’s Table ((Sept. 27), hosted by Chef Corbin at the new RiverShed overlooking beautiful Rustico River in Oyster Bed Bridge. The wide selection of Culinary Events include Garden Party (Sept. 6), PEI Beer Festival (Sept. 8-9), Roma Gala Heritage Feast (Sept. 9), Crawford and Nash, Worlds Collide (Sept. 13), Clammin’ N Jammin’ (Sept. 16-17), Big Clam Brunch (Sept. 17), InnSpryered Island Clam Bake (Sept 20), Buon Apetito (Sept. 20, Sept. 27), Cheese and Cheers (Sept 21, 23, 24), 10 Small Plates (Sept. 21), Roving Feast (Sept. 22), The Great Island Grilled Cheese Challenge (Sept. 24), Clinton Hills Oktoberfest (Sept 30) and Farm Day in the City (Oct 1). Also new for this year, Small Halls Festival organizers are building on another successful, uniquely PEI experience and are introducing three new Fall Halls events (Sept 7,8, 9) set in rural communities and featuring local performers and cuisine. Rounding out the lineup, the Festival also features a wide selection of hands-on Culinary Adventures and an extensive Restaurant Dining program. Restaurants feature special fall-inspired menus, with more than thirty participating restaurants across Prince Edward Island. A complete list of restaurants and menus are available at www.fallflavours.ca. Hosted by Canada’s Food Island, Fall Flavours is presented by Sobeys and takes place at locations across Prince Edward Island from September 1st – October 1st, 2017. For tickets or information, visit www.fallflavours.ca or call 1-866-960-9912.